Posted on Tue, Mar 20, 2012 : 8:07 p.m.
A large tree grinding machine has arrived on Dexter-Pinckney Road in Dexter Township. Editor's note: Additional information has been added to this story to explain the details of the $20,000 cost for the machine. An industrial-strength grinding machine from Macomb County has arrived on Dexter-Pinckney Road in Dexter Township to assist the Washtenaw County Road Commission in clearing a road that’s been closed since last Thursday and that usually sees between 18,000 and 20,000 cars a day. Tuesday afternoon, Jim Harmon, director of operations, told the Road Commission board that it will cost $20,000 a day for the special grinder and chipper, but it’s necessary. "The $20,000 per day cost includes all of our contractor’s labor and equipment. Harry Fox, Inc. has mobilized approximately eight heavy equipment operators, two hydraulic excavators for grappling trees and removing stumps, two large front-end loaders for loading timber, pushing debris, and loading chips, a forestry skidder, a tandem dump truck, the mobile grinder/chipper, and three truck and semi-trailers to haul away the wood chips," Harmon said. This cost also includes Road Commission crews and employees, he said. “We have four or five days of work ahead,” he said, adding that crews are trying to clear the tree debris first on the section of Dexter-Pinckney Road from Alice Hill Drive to Wylie Road so it can be reopened. Crews then will move from Wylie Road south to Island Lake Road. The large trees will be ground up and the debris will be trucked to a location outside of Washtenaw County, Harmon said. The Road Commission's Chelsea district crews are out in the township led by foreman Dave Trinkle, Harmon said. Foreman Don Hall and the heavy equipment crews are on the scene, as well as some members of Group Leader Tony Grubb's District 1 crews, Harmon said. About 15 employees in total are concentrating on cleaning up Brand and Quigley roads as well as Huron River Drive. Once all the trees and branches are removed, then the crews will sweep the road and determine any damage to a road, which was recently resurfaced. He said the road has already been scarred and it may need to be sealcoated once the cleanup operations have been completed. Plus, he said AT&T needs to get into the area to install about 7,000 linear feet of wire and replace a numerous telephone poles. Road Commission Chairman Doug Fuller said another assessment would be done by the end of the week. Wed, Mar 21, 2012 : 1:36 p.m. The wood chips could be used on the numerous County park pathways, as well as be offered to citizens. But they should not be trucked out of the County as the article says. I too have wondered why we have not see any photographs of Dexter-Pinckney Rd. And I have only seen a couple of Carriage Hills. Wed, Mar 21, 2012 : 12:20 p.m.
Ms. Allmendinger: I have read numerous articles that you have written, and implore you to either learn simple grammatical and proofreading skills, or find someone with editorial talent to clean up the mess. Wed, Mar 21, 2012 : 11:36 a.m. I don't remember seeing strorm photos of this area, it would be interesting to see. Wed, Mar 21, 2012 : 11:32 a.m. Thank you, Lisa. I find it interesting that these big machines exist. They will make quicker work of the clean-up. Probably saves both time and money on the really big projects. The community spirit and help following Dexter's tornado are inspiring. All the people who are interested in what happens to the wood chips should try to contact Jim Harmon, director of operations for the Washtenaw County Road Commission. Wed, Mar 21, 2012 : 1:33 p.m.
That should have been part of this article. What are they going to do with the chips? Wed, Mar 21, 2012 : 10:48 a.m.
We had stately oaks and maples uprooted and broken off. This place resembkes a war zone and you won't believe it until you see it. What once was a gorgeous tree canopy is no longer. It has changed the whole landscape especially the stretch of road between the second tee of the golf course to just past Mark From Michigan's house near where the hi voltage tower line crosses the road. God's power is awesome! Wed, Mar 21, 2012 : 11:56 a.m.
Musser Forests has a recovery deal for people who what to buy trees. The Michigan State Extension Office offers low cost trees in the spring. Both would be happy to help you replant. And over the next 50 years the canopy will return, your grandchildren will thank you for replanting. Wed, Mar 21, 2012 : 10:43 a.m.
As a resident on dexter-pinckney road, perhaps some of us could use woodchips for our re-landscaping projects once our cleanup is done. Wed, Mar 21, 2012 : 11:06 a.m.
Did you ask anyone there about that? Wed, Mar 21, 2012 : 6:15 a.m.
Where's the Snyder Emergency Managers solution to THIS? Have Dexter officials heard even a peep from I Commute by Helicopter Snyder? I don't know exactly which &quot;large trees&quot; were lost but I do remember seeing some truly stately oaks along that stretch of road. A sad situation all around. Wed, Mar 21, 2012 : 1:37 p.m. He was photographed at Huron Farms right after the tornado. Wed, Mar 21, 2012 : 12:52 p.m. Tru2...I was under the impression that the Emergency Managers were for failing local governments, am I wrong ? or are you just looking for any chance ( no matter how lame ) to take a shot at Snyder ? Wed, Mar 21, 2012 : 11:54 a.m. I have never seen the Governor commute by helicopter. Please provide a reference or link for this comment. Wed, Mar 21, 2012 : 12:57 a.m. I volunteer for a local woods (public schools property). 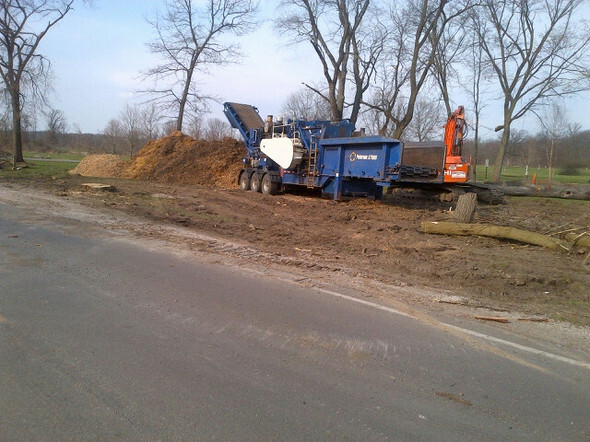 We maintain the fairly-high-traffic pathways with wood chips. Storms such as this last one can (and did!) wipe out years worth of trail maintenance. Who can I contact in order to fill up my 6-yard dump trailer with wood chips, and save the community some trucking costs by trading them for my volunteer hauling labor? Wed, Mar 21, 2012 : 3 a.m.
call the Dexter Township office in the morning. Wed, Mar 21, 2012 : 12:19 a.m.
What a waste of good fire wood and mulch. $20,000 a day? What is wrong with this picture? Wed, Mar 21, 2012 : 1:31 p.m.
pvitaly, did you read the article? It didn't say that. It just said that it would be trucked out of Washtenaw County. Wed, Mar 21, 2012 : 12:44 p.m.
How is this a waste of mulch and fire wood? When these trees get ground up, it's not the entire tree. It's mostly branches. The rest of the tree gets cut up and then sold as fire food later on. All the grindings from the branches is mulch that gets used elsewhere. What is your solution there know it all?